Bunions are a common presenting pathology for both adults and children. Most patients notice an increase in the deviation of their great toe and often have difficulty in finding show gear. A bunion is often described as a bump next to the big toe. However, it is actually a structural malaligment of the the metatarsal bone. Bunions are an inherited foot structure, they are a direct result of mechanical instability in your foot. They are a progressive disorder, that is they will only get worse. No tapping, splinting or stretching has been scientifically validated to reduce the bunion or reverse it. Do not be fooled by websites selling splints or other devices to fix bunions, these are falsities. Issaquah Foot & Ankle Specialists have specific treatment protocols establish from years of treating thousands of patients with bunions. We have the ability to provide pain relief and minimize the progression of the bunion. In addition we can correct the bunion in our surgery center if the need arises. The correction is often preformed by cutting the bone and moving it into the correct position. On the above x-ray it is easy to appreciate the bunion if you look at the left side of the x-ray and look for the two small rounds bones at the end of the first metatarsal. These two bones are called sesamoids and should be centered on either side of the metatarsal. You can see how the first metatarsal has drifted so the sesamoids are shifted to the outside of the foot, or the right side of the x-ray. 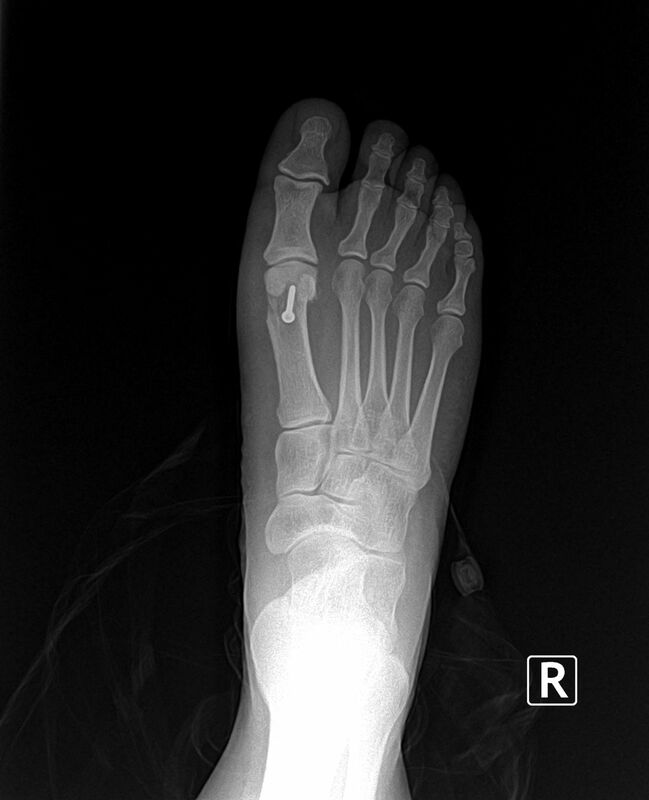 The above x-ray now demonstrates the correct alignment of the first metatarsal in relation to the sesamoids. I preformed the above bunionectomy procedure in our ambulatory surgery center, it only took about 1 hour and the patient was walking the following day.